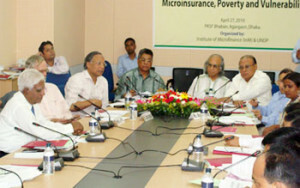 Second workshop on “Microinsurance, Poverty & Vulnerability” was organised jointly by the InM and UNDP, at PKSF auditorium, Dhaka on Tuesday, April 27, 2010. 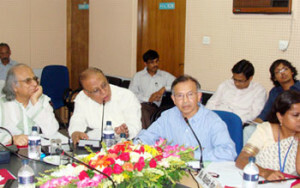 The workshop was for the dissemination of a study conducted by Professor Syed M. Ahsan et al. Representatives from national and international organisations, academicians and stakeholders of microfinance sector participated in the workshop. Dr. Qazi Kholiquzzaman Ahmed, chairman, PKSF adorned the chair of chief guest. Dr. Quazi Mesbahuddin Ahmed, MD, PKSF was present as special guest. Dr. Rashid Faruqee, Visiting Fellow, InM Chaired the ceremony. Among others, Mr. Goran Jonsson, Professor Baqui Khalily, Ms. Majeda Huq were also present there. This workshop was a continuation of the previous workshop on Microinsurance, Poverty and Vulnerability, which was for the dissemination of the findings of two other papers. In his welcome address, Interim Executive Director, Dr. Md. Mosleh Uddin Sadeque thanked everyone present there to make the programme successful. He also mentioned that it was an honor for Institute of Microfinance to have so many renowned people together at that workshop. In his first paper, Professor Ahsan dealt with the necessity of introducing appropriate microinsurance products to help poor people cope with shocks like illness, flood, cyclone, drought etc and. Drawing on different insurance products of different commercial insurance providers and MFIs, the paper suggests some steps that should be taken to roll out any kind of insurance products for the poor. The second paper deals with delivery and regulatory issues. The desirable criteria for choosing among delivery models in terms of their potential are: awareness building, transaction costs, the role of trust for delivery efficiency, cost effectiveness, timeliness of claim settlement, subscriber inclusiveness, and finally long-term sustainability. The paper suggests a new set of Microinsurance regulatory and supervisory directives issued by the ministry of finance. 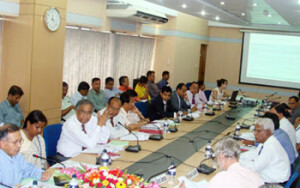 For instance, clear definition, simplicity of Microinsurance products, quantification, eligibility for insurance, duration of coverage, life versus non-life products, promoting inclusivity, separation of credit and insurance activities, reserves, capital adequacy and related prudential guidelines, design, accumulation and investment of the insurance fund and policy delinquency, audit and supervision, reinsurance, educating the regulator can be the regulatory directives that highlight the key goals of cost efficiency, financial viability and inclusivity. Dr. Goran Jonsson, International Team Leader, REOPA project, UNDP, Bangladesh said that this is very positive signal for us that Bangladesh has now several organisations which can build up the fundamental stage for a win-win game to be performed. NGOs are currently engaged with microcredit, but they can partake in the provision of microinsurance to the poor so that social safety can be improved. Dr. Quazi Meshbahuddin Ahmed, Managing Director, PKSF, pointed out that there are several challenges in provision of Microinsurance. For instance, regulations and legal clarification should be thought about in advance. Dr. Qazi Kholiquzzaman Ahmed, Chairman, PKSF opined that to make microinsurance sustainable, sustainability of all agents working in the process at different levels must be considered. Sustainability of not only partner organisations also that of poor borrowers’ is simultaneously important. He also said that microinsurance can never be a product, rather it is always a service, as it focuses on the poor section of the society which is unable to buy the prevailing products of insurance. Dr. Faruqee ended the seminar expressing his thought that Microinsurance can be comparatively more effective than microcredit in meeting shocks. However, there are rooms for conceptualising the terms and rules going to be used in microfinance.